Happy Leap Day! To celebrate, I decided to post this recipe, which is a fun play on the classic Green Beans Almondine. It is a traditional French dish made with steamed green beans, butter, and toasted almonds. I prefer to cook tough vegetables like green beans and broccoli by doing a combination of steaming and sauteing. I like the taste of seared edges combined with a softened inside. To mix it up and make things fun, I used the cherry tomatoes to provide liquid for a sauce and a bit of brightness to the green beans. The red pepper flakes add some heat and surprise to make them angry. You, on the other hand, won’t be when you try them. Trim both ends of the green beans with a knife or kitchen shears. Bring a large saute pan to medium heat with 2 tbs olive oil. 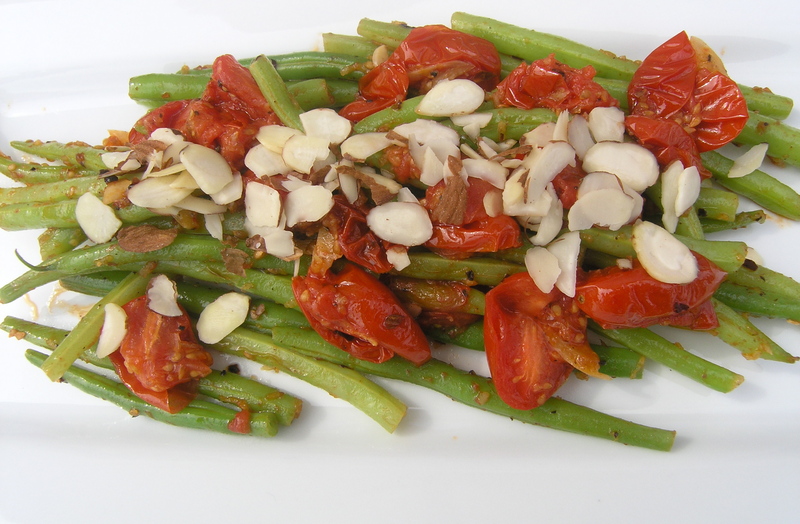 Cook the garlic, green beans, and cherry tomatoes for 5 minutes, or until the green beans start to brown on the edges. Add the lemon zest and juice and the red pepper flakes. Add 1/4 cup water to the pan, cover, and cook for another 5 minutes. The green beans should be soft enough to chew through, but still have texture. Remove the green beans onto a serving platter with tongs. Leave the remaining juices in the pan to cook the almonds. Add the almonds to the pan and cook for about 3 minutes, or until they are toasted. Be careful not to burn them! Pour the almonds and remaining sauce over the green beans to serve.